The People’s Progressive Party Civic’s Charles Ramson Jr. The People’s Progressive Party Civic’s (PPPC) Charles Ramson- considered one of the young prominent faces of his party- has resigned from Parliament with immediate effect to take up a British scholarship to pursue studies in oil and gas, he announced Sunday. “While the decision was easy, it was still one of the toughest things I have had to do… Friday I submitted my letter of resignation from Parliament,” he said on his Facebook profile. Ramson said on his Facebook profile. The United Kingdom (UK) has awarded him a Chevening Scholarship to pursue a Masters of Science (Msc) degree in oil and gas enterprise management at the University of Aberdeen, Scotland. The PPPC and Ramson had been dodging questions for months about whether he would have been leaving active politics to seize the educational opportunity. In his letter of resignation to House Speaker, Dr. Barton Scotland on September 30, 2016, the PPPC parliamentarian suggested that he is positioning himself to become a key decision-maker in Guyana’s oil and gas sector. “As Guyana continues to move in the direction of becoming an oil and gas producing nation, it is absolutely critical for our national development that we have Guyanese who are technically trained in the oil and gas sector. This is particularly important for us as a nation in this preparatory phase as we frame the relevant policy, law and vision if we are to avoid the often cited “resource curse” commonly associated with oil and gas producing nations. There is no doubt that the absence of any member of the Cabinet with any such technical training or experience in the sector will have a militating effect on the pace and quality of development not only of the nascent sector but of the country. Worryingly, this absence will also increase the likelihood of squander and consequently, the expected benefits will elude the Guyanese people,” Ramson said. In an apparent effort to portray young and new faces, though a backbencher, Ramson was often given or took the opportunity to speak in the National Assembly. He was also at the forefront of many of his party’s street protests. 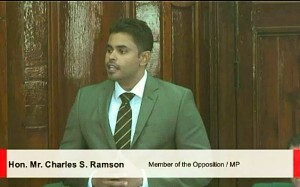 Ramson used the opportunity to tell the House Speaker in his resignation letter to express “extreme disappointment” with the absence of youths in Cabinet and on the government benches, saying that it “increases political apathy and destroys legitimacy.” “This is particularly regrettable given the youth drive leading up to the election and now young people feel betrayed and voiceless,” he said. He also criticized the APNU+AFC government for not doing enough to forge national unity and losing the opportunity to do so in the National Assembly by allowing Bills to be subjected to scrutiny by bipartisan parliamentary select committees despite pleading by the opposition PPPC unlike the last eight years of his party while in government. “The squandered opportunity which cannot now be regained would have framed the success of politics by forging a working relationship among political leaders in a country plagued by divisions in politics and race or a combination of both. Admittedly, this may have slowed the process but being able to work together despite differences is the extolled virtues of a democracy. This is really what the Guyanese people would have wanted first and foremost from us Parliamentarians – lasting unity forged in struggle rather than notional unity spoken in the abstract,” he said. Ramson is the son of former Attorney General and Retired Justice Charles Ramson Snr. who is Guyana’s Commissioner of Information under the Access to Information Act.